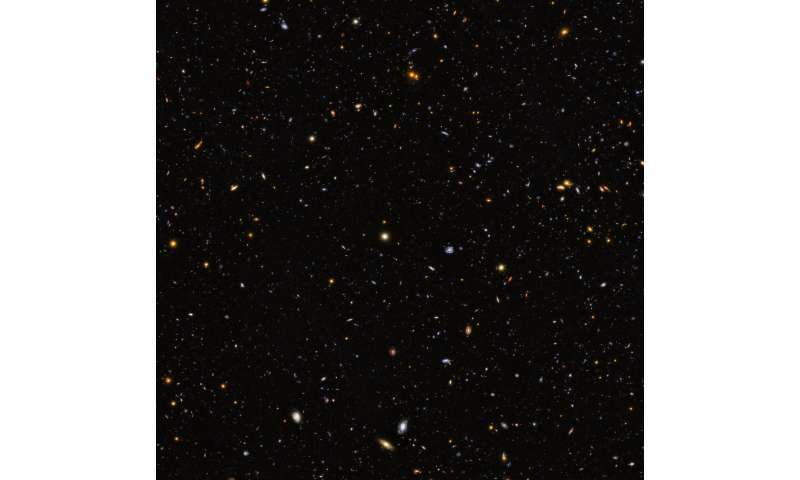 This image from the Hubble Deep UV (HDUV) Legacy Survey encompasses 12,000 star-forming galaxies in a part of the constellation Fornax known as the GOODS-South field. With the addition of ultraviolet light imagery, astronomers using the NASA/ESA Hubble Space Telescope have captured the largest panoramic view of the fire and fury of star birth in the distant universe. Hubble's ultraviolet vision opens up a new window on the evolving universe, tracking the birth of stars over the last 11 billion years up to the busiest star-forming period in the cosmos, which happened about three billion years after the big bang. So far, ultraviolet light has been the missing piece of the cosmic puzzle. Now, combined with data in infrared and visible light from Hubble and other space- and ground-based telescopes, astronomers have assembled the most comprehensive portrait yet of the universe's evolutionary history. The image straddles the gap between the very distant galaxies, which can only be viewed in infrared light, and closer galaxies, which can be seen across different wavelengths. The light from distant star-forming regions in remote galaxies started out as ultraviolet, but the expansion of the universe has shifted the light into infrared wavelengths. By comparing images of star formation in the distant and nearby universe, astronomers can get a better understanding of how nearby galaxies grew from small clumps of hot, young stars long ago. The observation program harnessed the ultraviolet vision of Hubble's Wide Field Camera 3. This study extends and builds on the previous Hubble multi-wavelength data in the CANDELS-Deep (Cosmic Assembly Near-infrared Deep Extragalactic Legacy Survey) fields within the central part of the GOODS (Great Observatories Origins Deep Survey) fields. This mosaic is 14 times the area of the Hubble Ultraviolet Ultra Deep Field released in 2014. It would seem that the expansion of the Universe is irrefutable, overwhelming evidence in its favour. But where does it start? A thousand light years away from us? A hundred? A single light year? No, it starts in every particle in our Universe, including those within us. Everything is expanding. We call this phenomenon TIME, and its side effect is the "gravity" we feel as the expanding Earth provides acceleration at its surface. There ain't no gravity as a force! No Dark Matter, etc., and "gravity waves" are actually "time quakes".